Made-up like a fox, with face-paint just a shade more orange than a TOWIE tan, Foxy & Husk (it’s just one person, performance artist Isolde Godfrey) is more cutesy than vulpine. But, like a fox, she’s a scavenger and what she’s collected is an assortment of stories and songs about identity in Britain. 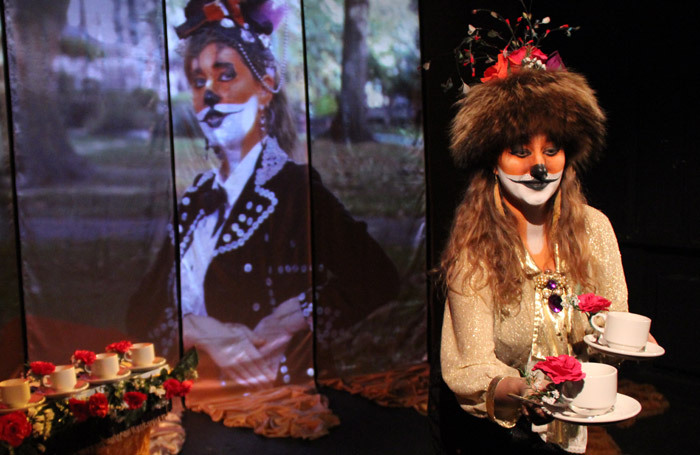 Through a slightly ramshackle mixture of video projection and precise lip-syncing Foxy creates her own lo-fi ‘symphony’, beginning with the National Anthem, whose rousing pomposity is immediately pricked by Led Zeppelin’s screaming, bawling Immigrant Song. Although the show claims to be about identity, certain sections – such as a rendition of Pulp’s Common People in an RP accent – suggest that it’s more about class and the tension between authenticity and performance: we all perform our class to an extent. As she lip-syncs, Foxy adds mannerisms and facial expressions that characterise the voices. From a lovely old Scottish man to a woman munching on Bombay Mix, it’s easy to forget that it’s all delivered by a person got up like Basil Brush. In no small part that’s due to Foxy’s extravagant costumes and extraordinary hats, all drawing on different cultures. The irony of delivering someone else’s words about identity while hiding behind an animal mask is clearly not lost on Foxy; it’s precisely this mismatch between these very human stories, and the not-quite-human facade that gives the show its meaning.